The squadrons of New Hampshire Wing, Civil Air Patrol are looking for Pilots & CFIs to become part of the all-volunteer United States Air Force Auxiliary. If you’re a pilot, Civil Air Patrol (CAP) has plenty of opportunities for you. 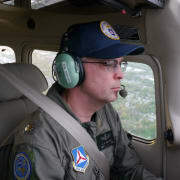 CAP operates the largest fleet of single-engine piston aircraft in the world, primarily Cessna 172s and 182s, and CAP pilots fly those planes to perform missions in service to their local communities such as search & rescue, disaster assessment, cadet orientation flying and U.S. Air Force support. If you’re a CFI, CAP is working with the U.S. Air Force to provide additional flight training opportunities to young men and women interested in becoming pilots. Civil Air Patrol CFIs also train fellow member pilots for upgrades such as TAA (Garmin G-1000 glass), instrument and commercial ratings. The Manchester Squadron meets each Thursday at 6:00 p.m. at National Flight Simulator (175 Ammon Dr, Manchester Airport).